TODAY IS A SPECIAL DAY! A VERY SPECIAL DAY! Today is the first time Mr. Colby Sharp and I will celebrate a book's birthday online and in person on the same day together. The book? 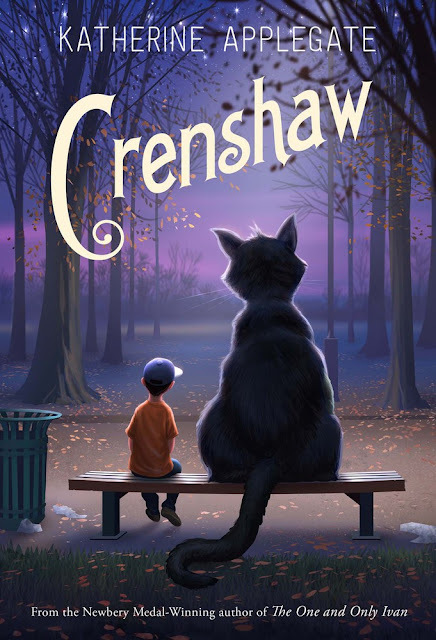 Katherine Applegate's Crenshaw. Where? The Nerdy Book Club's blog, Colby's blog, here, and Parma Elementary School (where Colby Sharp teaches 3rd grade). The excitement level? Off the charts. 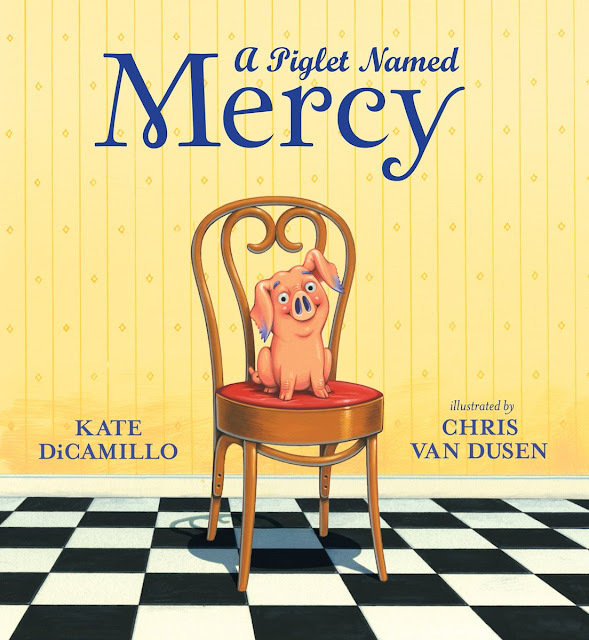 We hope you have fun jumping from blog to blog and celebrating Katherine's beautiful book. Publicist and book lover extraordinaire Mary Van Akin dropped by Watch. Connect. Read. to finish my sentences. We chatted about Crenshaw, Katherine Applegate, food drives, and purple jelly beans. I wrote the words in purple, and she wrote the words in black. Thank you, Mary! Jackson and his family are a loving family. They are on the verge of homelessness when Jackson’s childhood imaginary friend, Crenshaw, returns. I think Katherine Applegate has a way of writing characters that find their way right into your heart. 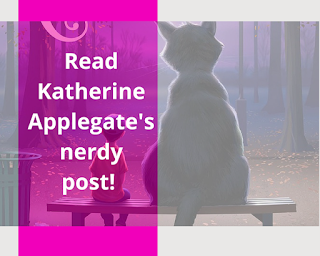 Reading a new Katherine Applegate book feels like meeting a new friend who you know will move and change you. A friend that you’ll want to visit with again, and again, and again. Turn to page 222. You’ll find my favorite passage in the whole book, at the very end of my favorite chapter. I think it’s your favorite page, too, Mr. Schu. 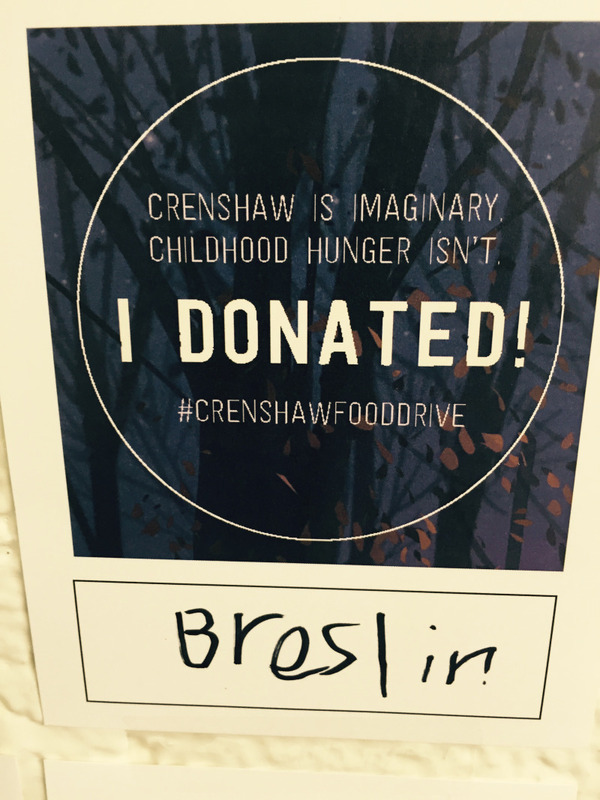 Join the Nationwide Crenshaw Food Drive to help feed families in need. 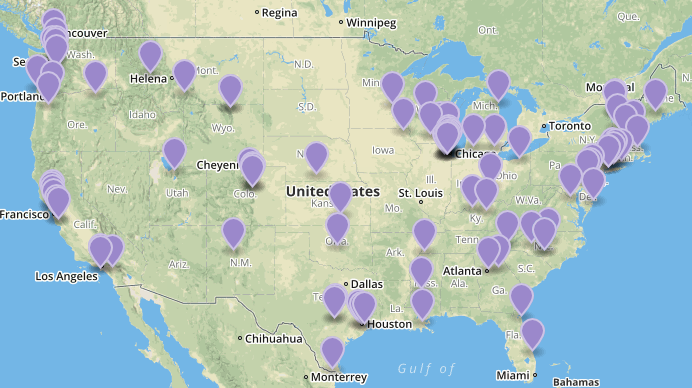 Over 100 bookstores across the country are partnering with food pantries to host food drives throughout the month of October. 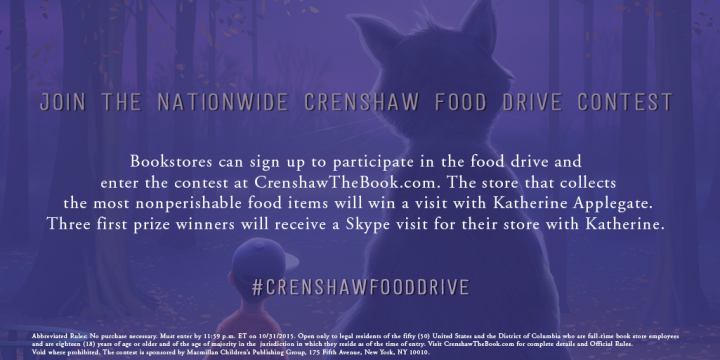 Katherine has a way of writing books that start conversations, and we wanted to find a way to turn the conversation surrounding childhood hunger into action on both a local and national level. It has been so heart-warming to see how enthusiastically booksellers, teachers and librarians, and especially young readers have embraced the food drive. Visit CrenshawtheBook.com to find a list of all participating bookstores, and to learn other ways to help. Did you know that one out of five children in America is struggling with food insecurity? Unsurprisingly, malnutrition has a severe, negative impact on a child’s development (see some more stats on NoKidHungry.com here). It’s really sobering to think about how many kids like Jackson might never reach their full potential because they do not have a reliable food source. You can help by hosting a food drive in your school or library any time of year! Food pantries are always accepting donations, and a food drive is a really empowering way for students to see how they can make an immediate difference in their communities. 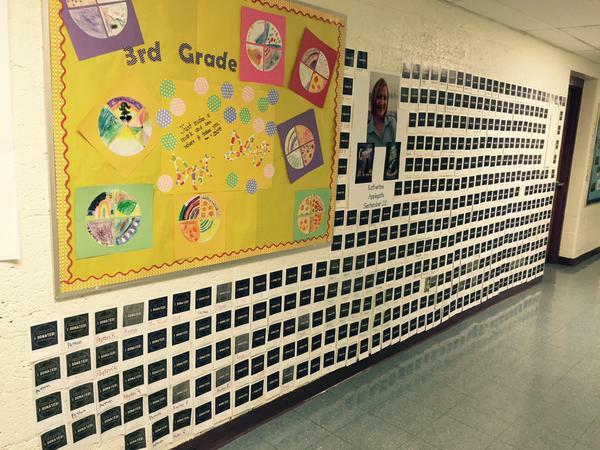 Parma Elementary in Parma, Michigan created this amazing ‘I donated’ wall for their students. Mr. Schu, you should have asked me how many flavors of purple jelly beans I taste-tested for Macmillan’s big Crenshaw mailing to booksellers, librarians, teachers, and reviewers. But since you didn’t ask, I’ll never tell! "Hosting an author visit the eleventh day of school is a little tricky. 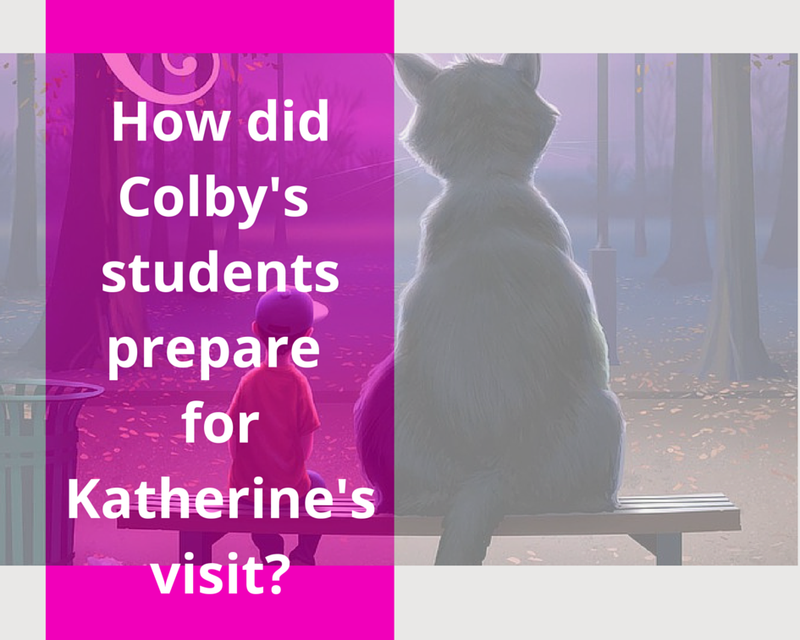 I usually spend a little bit of time each day for about a month prepping my students for an author visit. Thankfully, every fourth and fifth grader in our school has already had Ms. Applegate’s The One and Only Ivan read aloud to them. The Parma third graders started the year as the only students not familiar with her work." -Colby Sharp | Click here to read the rest of his post. "An awful lot of authors are introverts by nature. If you like solitude and imaginary friends, it’s the perfect vocation. Nonetheless, every couple of years or so, depending on one’s prolificity, the specter of Book Tour — that magical time when introverts transform into faux-extroverts — returns." -Katherine Applegate | Click here to read the rest of her essay. Borrow Crenshaw from your school or public library. Whenever possible, please support independent bookshops. I'm so looking forward to reading this book!! And I love that bookstores are partnering for the food drive. Excellent! I was fortunate to snag a signed copy of CRENSHAW at ALA this summer. It's an amazing book indeed!